J K Rowling's sequel to Harry Potter and the Philosopher's Stone carries on where the original left off. Harry is returning to Hogwarts School of Witchcraft and Wizardry after the summer holidays and, right from the start, things are not straightforward. Unable to board the Hogwarts express, Harry and his friends break all the rules and make their way to the school in a magical flying car. 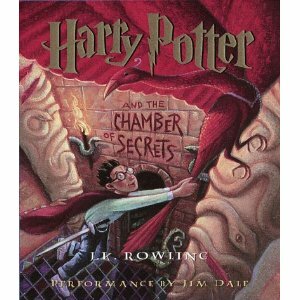 From this point on, incredible events happen to Harry and his friends--Harry hears evil voices and someone, or something is attacking the pupils. Can Harry get to the bottom of the mystery before it's too late? I've forgotten how much I enjoy this story. There is no denying it is a classic. There is so much to like about it. Rowling has created a world so creative that it's practically brain candy. I love that this sequel starts off right where the 1st book left off. Nothing is left out! I also kind of hate the Dursley's. I mean seriously. What kind of people are they?! I love that Ron came to rescue him. Narrator Jim Dale really took this novel up a notch for me. He did all the voices brilliantly and there were times (most of the book) where I forgot he was the only one reading to me. He is that brilliant! It has been over a decade since I've read this book and it was better than I remember! When was the last time you read the Harry Potter series? Listen to them on audio, they are superb! Now, since I've listened to the first 2 books on audio, I'm going to watch the first 2 films. Very excited! This will be such fun going through the series again! "Ginny!" said Mr. Weasley, flabbergasted. "Haven't I taught you anything? What have I always told you? Never trust anything that can think for itself if you can't see where it keeps it's brain?" I think I may make this series my next audiotape series. I do love some Harry Potter and this sounds fantastic!